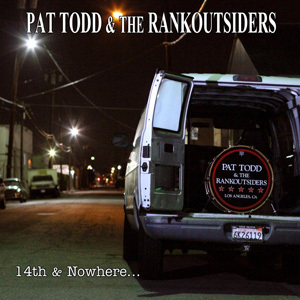 Pat Todd & The Rankoutsiders: "14th & Nowhere…"
The latest release from Pat Todd & The Rankoutsiders is 14th & Nowhere…, a record full of great rock tunes that sound like they came straight out of a garage, but in a good way. The album is full of songs that are smartly written and passionately played, and will be adored by older rockers and the current generation. After listening to 14th & Nowhere…, it’s clear that The Rankoutsiders are out to write great music that connects with people. Playing music for over 20 years, Todd is no stranger to rock 'n' roll. After starting the Los Angeles group the Lazy Cowgirls in 1983, Pat is now back with a new band that plays solid rock and roll and performs with a passion that is hard to match. The opening song “Carry’n A Torch” is a perfect opening track with its blistering guitars and punk rock feel. Pat has the perfect gritty and gravelly voice for fronting this type of band who seem determined to make everyone listen to the record more than once. Instead of feeling like the band is too old to be playing rock and roll, we hear a very colorful and modern take on the genre, which feels like we are revisiting the rock era of our parents. The group is out to honor their rock and roll ancestors of the fifties, sixties, and seventies, and they make their music explode out of the speakers with booming drums, crisp guitar solos, and a lead singer who sings like he’s giving his last performance. “Small Town Rock Ain’t Dead” is a rollicking tune that still carries the same punch as the records previous songs. On this track, we hear a piano that adds a different dimension to the music. Still sounding like a rock track, its more laid back demeanor might feel a bit off putting since we are used to the band being so hard hitting by the time this track starts to play. “No End In Sight” takes a dramatic turn as we hear the band playing a more country and folk band that gives the band a bit of a softer edge. While we have heard the band tear through eleven tracks without stopping, “No End…” allows the band to strip down and show a softer side of them that we never thought we would hear. The harmonica heard on the track gives the song a nice touch, as it gives the song a more authentic country feel. “One More Gas Tank Revisited” is the most punk rock track on the album. Its classic punk beat is a song that goes down as one of the album’s strongest songs. Every member of the band plays together perfectly, but mostly importantly “Gas Tank” shows that the band hasn't lost their edge despite having a front man that has been in the music business for over two decades. If you are into good old fashion rock and roll, you can’t get much rawer than Pat Todd & The Rankoutsiders as their music deserves to be listened to.